The artwork, called Last Train, was commissioned by Steinmetz Diamonds, and is intended to portray the strength of diamonds. A composite cast of Arad’s clenched fist wearing a diamond ring is used to scratch an enlarged replica of the iPad sketch onto a lead-glass panel which is illuminated along its edges by LEDs. The work (above) is on show at the Biennale until 24 November. 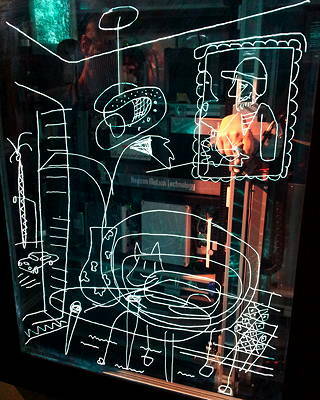 Already, it has been used to convert iPad sketches by artists including Ai Weiwei, Anthony Gormley and Francesco Clemente, into glass engravings. An app running on the iPad outputs details of the sketch via Wi-Fi to a PC which feeds the information to a two-axis mechanical positioning system. A third axis moves the fist and its diamond ring towards, and away from, a glass panel measuring 875mm by 1155mm. The first prototype system, based on stepper motors, proved erratic and did not transfer the image onto the glass as quickly, smoothly and accurately as Arad wanted. The stepper motors were also noisy. In the prototype, a solenoid was used to position the diamond against the glass but it proved difficult to control and caused a shock to the glass when it was “fired” into the etching position. Furthermore, the H-frame gantry positioning system did not allow the diamond to cover the whole area of glass, limiting the visual impact of the artwork. Also, it was not possible to fit all of the drive and control electronics inside one cabinet, necessitating a separate control enclosure which would not be ideal for use in an art exhibition. The UK motion systems integrator Heason Technology was therefore called in to design and build a system that would fit inside the restricted dimensions of a presentation cabinet. The delays caused by the attempts to build the original prototype meant that Heason had only around 12 weeks to design, build and deliver the system in time for the opening of the Biennale in early June 2013. The company would have preferred twice this time to design the system, perform the necessary reviews, and allow sufficient lead-times for components. The company based its design on an extruded aluminium profile base frame, and Thomson Movopart belt-driven linear positioning slides in an I-frame (or rotated H-frame) arrangement. Two synchronised parallel horizontal axes support a single vertical traversing axis, allowing the fist and diamond to reach all parts of the glass.